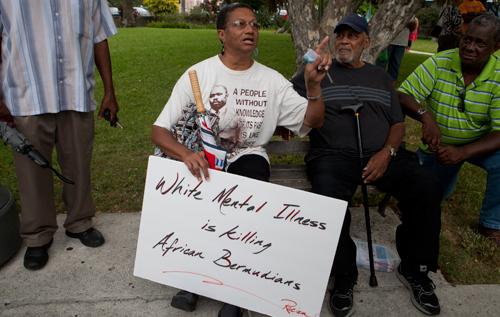 CURB has been concerned at the focus placed on the lady who held up a sign at Friday's protest march stating "White Mental illness is Killing African Bermudians", and the bitter, vitriolic and angry posts on social media. CURB believes the sign was divisive and inflammatory, however, we do not condemn or judge this lady. Her sign is a symptom of her anger, pain and hurt, and society must ask itself what it has done to this lady that makes her need to carry this sign. Nelson Mandela said, "No one is born hating another person because of the colour of their skin, or his background, or his religion. People must learn to hate, they can be taught to love, for love comes more naturally to the human heart than its opposite." As such we must all begin to understand that our society is not healthy, that we have allowed a wound to fester and have never tried to heal it, much less pay it attention. So perhaps this lady's poster is a sign to us that we must look inwards not only at the individual level, but also as a community and deal with past pain and its present manifestations and distrust. We acknowledge it is hard for many white Bermudians to look at this hurtful sign without anger. However we have noted that, buried amongst the vitriol and condemnation online, there have also been white Bermudians and others posting a desire to understand something that is so disconnected from their perspective. One in particular stands out for us, and it is the post by Adrian Beasley on his Facebook page, which we quote in full with his permission. We applaud this young man's openness not only in attempting to consider another's perspective, but also in the recognition and contemplation of his own privilege and a willingness to recognize that society is at fault. We encourage all persons in Bermuda to engage in this level of compassionate self-reflection and to consider the part they may play in healing our community. "So I've had quite the change of heart about the 'white mental illness' sign from Friday's protest. At first I was incensed at the 'racism' and was eager to label the sign's holder as uneducated or ignorant and was happy to quote love and intolerance using Nelson Mandela back at this situation. I was happy to send and receive jokes about equivalent signs or getting T-shirts done up. All of my reactions were outward and retributive. I am, as a "white" Bermudian, concerned at why this woman felt that she needed to hold this sign in public because as much as we (white Bermudians) would like to and would benefit from thinking (because we would not have to actually do anything) that this is her problem and her issue and her own racism, it is realistically our collective problem and issue. I was taught a long time ago, that when it comes to race and race issues, perception equals reality. The holder of the sign obviously felt passionately enough about her hurt or her anger to carry this sign in public. Whether or not her hurt or anger is in our minds justified, it doesn't matter - because it matters to her. Her perception is her reality. She is being more honest and public with her concerns with race relations in Bermuda than I ever have been. She is in effect starting a "big/uncomfortable" conversation. But what did I do? I completely shut down. I pointed fingers, I used words like uneducated and ignorant. I was outraged at the "racism". I shared the story on Facebook and spoke about it with certain friends. More importantly, what I didn't do (until now) was to consider why she felt so passionately about holding this sign. It never once occurred to me to be concerned as a Bermudian that one of my fellow Bermudians felt so hurt or so angry. It also never occurred to me that this could be my problem to deal with - or at minimum partly my problem. I also didn't ask one non-white friend about what they thought about the sign, and when I looked at my previous Facebook comment, I noticed it had 42 likes and several comments, none of which were from African Bermudians. Talking about race and racial issues is difficult/uncomfortable for me as a white Bermudian - and that is my reality. Anything that starts a meaningful conversation or makes us have personal reflection whether or not it is an inflammatory sign, I have to admit is a "good" thing - so thank you unnamed lady for making me look inwards. So while I'm still outraged about the sign, it is for a different more upsetting reason. I am upset with myself for falling into the trap of my own white privilege and not being able to see beyond my own insecurities and to be outraged that a fellow Bermudian is hurting. Our collective concern should be the well-being of each other. If one of us is hurting then we should all be trying to figure out what is wrong. If one of us is being discriminated against then we are all being discriminated against and we should fix it. This one-sided rant is ending, but I am giving myself the task of being more open to difficult conversations, where ever their origins may be. I am going to put myself in the situation of having uncomfortable conversations about this sign. I encourage you to do the same."